A Downtown Charleston fixture, nestled on the corner of Quarrier and Hale Streets, Art Emporium is a go-to location for art, art supplies, small and cool physical objects and all your framing needs. In addition to notepads, calendars gift cards, paperweights and other cool gift ideas, at next week’s Black Friday Artwalk Art Emporium will play host to a new exhibt, The Art of Brian Zickafoose. 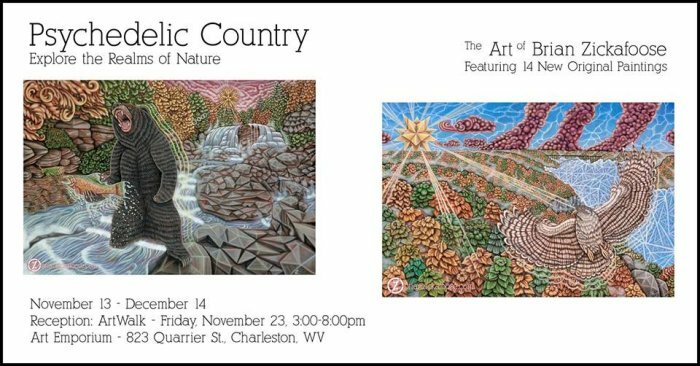 On November 23rd from 3:00-8:00 PM at Art Emporium in Downtown Charleston, WV hosts a special art reception with sacred artist, Brian C. Zickafoose. The Psychedelic Country exhibit will run at Art Emporium from November 13 – December 14. The works to be featured at this show are an exploration of light and depth. There are several new landscapes that focus on the magic of famous West Virginia destinations. This exhibit will also featuring a dozen new tiny original paintings called, PSY-Matics, which are an exploration of how light is expressed through sound. Viewers can expect a world of eye-candy and painterly wonder. Several other area artists sell their work through Art Emporium, and if you can’t figure out what gift to give, you can purchase a gift certificate and shift the burden onto the artistic-minded person on your holiday shopping list. Art Emporium is located at 823 Quarrier Street in Charleston, and they’re open Tuesday through Friday from 10 AM to 6 PM and Saturday from 10 AM until 4 PM. I would expect them to have some extended hours through the holidays. Check their website and Facebook page for more details. PopCult Note: Due to pressing outside deadlines, The PopCulteer will be taking this week off, but will return on Black Friday. 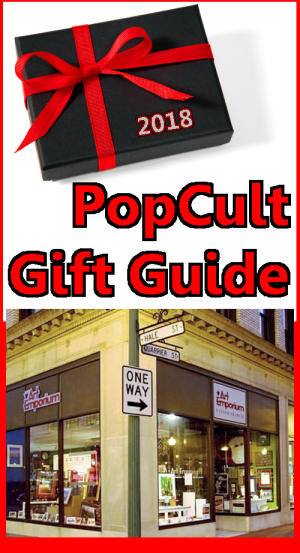 The 2018 PopCult Gift Guide will continue with Big Ticket Day on Saturday and Sunday.